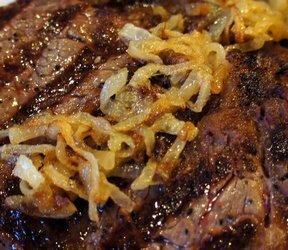 Mild, sweet, and delicious, caramelized onions are great as a topping for steak or as a savory appetizer when spread on toasted baguette slices. Cut onions in half lengthwise and peel off outer layer. Cut onion halves crosswise into 1/4 inch slices. Separate the layers of each slice into individual pieces. Heat vegetable oil and butter in a 10-inch non-stick fry pan over high heat. When oil and butter are heated and foaming stops, add the salt and light brown sugar. Quickly stir to mix. Add the onions and carefully stir to coat them as thoroughly as possible. Cook over high heat for approximately 5 minutes, stirring occasionally. Onions will begin to soften and release some of their juices. Reduce heat to medium. Continue to cook, stirring often. 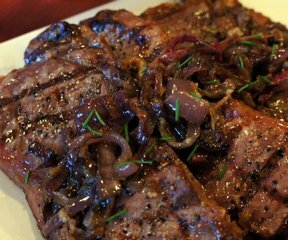 If the onions begin to cook too fast and scorch, reduce the heat immediately. If they are cooking too slowly and have not started to brown after 20 minutes, increase the heat slightly. 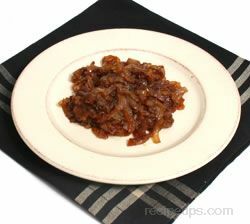 Cook until onions are soft, have a glossy look, and are a deep, rich brown color. This may take 40 to 50 minutes.